German materials firm Bayer MaterialScience (BMS) has helped enhance the official European Championship soccer ball with materials. 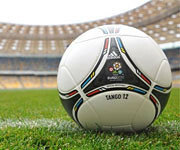 The Adidas ball is said to have improved properties, allowing for faster acceleration and better control of the ball. The surface texture of the official European Championship ball feels like denim, allowing for better ball control. The shell is made up of five layers with a total thickness of 1.1 mm. The middle layer � an Impranil foam containing millions of gas-filled microcells � is responsible for the optimal contact of the �Tango 12� to the foot. The upper layers protect the foam from external influences and help keep the ball looking new longer. Another speciality material from BMS is used for a patented thermal adhesive layer that makes the ball virtually impermeable to water. The ball�s name and design are every bit as traditional as its insides are modern. The Tango debuted at the 1978 World Championship in Argentina, and its successors provided for plenty of goals at subsequent championships in the 1980s.